When artist Thar Sayegh fled the war in Iraq in 1999, he not only left behind his home, but also his education and his career as an art teacher. He lived in Jordan as a refugee for fourteen years before relocating to Anaheim, California. The move brought along with it a loss of a different kind when he was forced to give up his art. Sayegh now lives in Greenfield, Pittsburgh with his family and works as a driver for Uber and Lyft. He also takes classes at the Community College of Allegheny County. Before moving to the U.S., he worked in his career as an artist for over a decade. Now, he attends painting classes in the hopes of becoming a full-time artist and art teacher. He says, “I feel that I have more energy or power when I can do something with deeper meaning or with a message.” The vivid expressions depicted in his paintings are both realistic and blurred by colorful swirls of his brush. 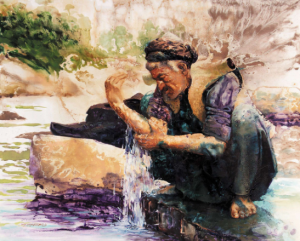 While he was in the Middle East, he painted anything which related to people, such as daily life scenes where he would capture special moments. Through his paintings, he wanted to show how people suffer and the sacrifices they make for one another, the place they belong – where they were born and raised. He spent a significant period of more than ten years developing his oil painting skills so that he could do something special with his art. 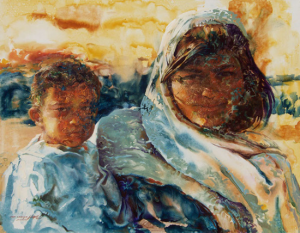 Sayegh’s was recognized as a talented artist at a young age and studied art at the University of Mosul in Iraq. Unfortunately, one year before he completed his studies, his family were forced to flee Iraq and obtained refugee status in Jordan. There he was not able to own a home, complete his studies, or travel. He did, however, live as a professional artist after his friends introduced him to the owner of the Orfali Art Gallery in Amman, who was more than happy to take him on when he saw how talented he was. He worked as a teacher for a trial period before working full-time and designing the curriculum for students. 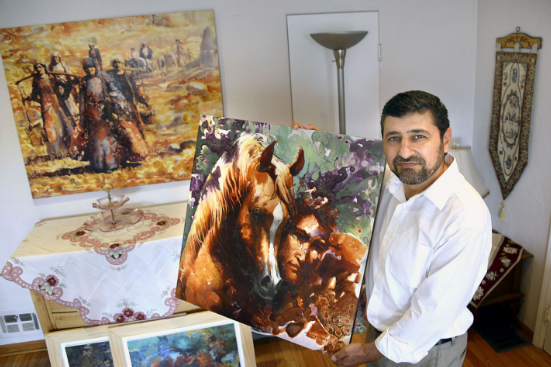 In no time, his work was recognized in Iraq and Saudi Arabia, and he exhibited his work in Manhattan along with other Iraqi refugee artists. In 2013, Sayegh, his wife, and two children were ordered by the United Nations to relocate to California. He was finally able to continue his studies, but although he continued to exhibit his art, he could not find buyers and eventually had to look for other work. Not being able to work as an artist was a great loss for him, as he put all his efforts into his job. The family made a decision to move to Pittsburgh for a slower-paced lifestyle with good educational institutions and a more affordable way of living. It was also closer to the New York art world, as well as Europe and the Middle East. Lower living expenses meant that he could complete his studies to qualify as an art teacher. Sayegh says, “Through classes, I came back to my brushes,” after not having painted for over two years. He now finds the city’s natural beauty inspiring and is engrossed in his class assignments. “It’s refreshing my mind and my hand to come back to my skills,” says Sayegh who looks forward to the opportunity to have the time to paint once more.